Aw c’mon, you just got that jacket today! Now it’s gonna be all dirty. Oh no Helvetica, your suit! Haha even the fish are skeletal that’s cute. I wonder what he will see in his reflection. I thought the quest to get here would take chapters and chapters. How wrong I was! Now (like the other commentors) I am excited to see what he sees! I’m not sure if it’s the Fish that disconcerts him or the reflection he sees. And of course the page ends before we get to see the reflection and we have to wait a week to find out. Oh well, at least anticipating the next update is a clear-cut sign of a good comic! Hehe sorry to leave you hanging! It’s such a dirty trick!! I really love the moment-to-moment transition in the last 2 panels. It’s a really great way to let the character “act” so we can see his change in expression. That was… rather anticlimactic. The way Heavens and Steak made it seem, I thought it would be some dramatic and epic climb, spanning pages but.. well, he’s there with a huff and a puff. I am indeed curious to see what his he sees in the lake but I have a feeling hes just going to end up looking at his bony reflection. Haha! Who wants to see more than a week’s worth of rock-climbing? Heavens certainly has no filter for his hyperbolic nature, it seems. And that suit, killer swag. Hey just discovered this comic today, looks really good and something I’ll definitely be checking back on! Is it wrong though that whenever good heavens talks I’m imagining David Hyde pierce’s voice? I can’t help it! WHERE IS THE SWEAT COMING FROM?! I’m gonna stick my neck out here and make a guess and I’m with Pixelray: Vet’s just going to see’s his skully reflection. I clicked on this banner on Monster Pulse, and I like it so far! 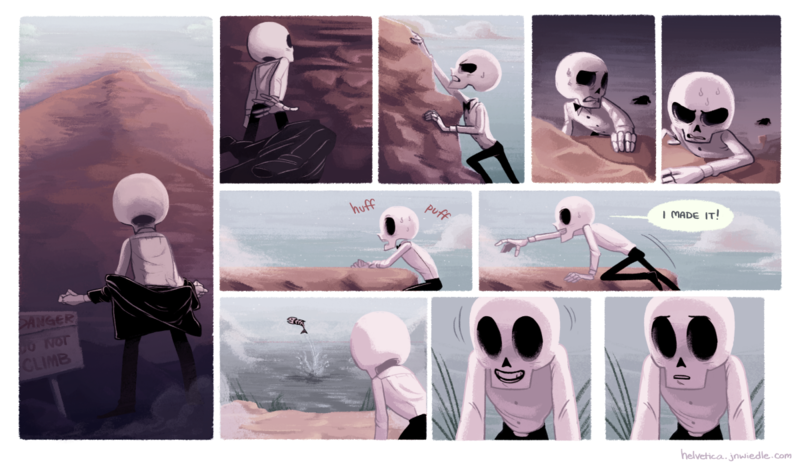 Undertale refrence:*You finally find the lake mountain! *You are filled with determination!